Stock market analyst Hitendra Vasudeo of stockmechanics.com has maintained ‘Sell’ rating on ABG Shipyard stock to achieve a target between Rs 143.50 - Rs 133.70. The investors are advised to sell the stock in order to avoid loss, as there are full chances of a downward trend in this stock. If the stock fell below Rs 128, it may see more weakness. According to Mr. Vasudeo, investors can sell the stock around Rs 149.60-Rs 153.20 with a strict stop loss of Rs 158. After selling the stock in today’s session, the interested investors can enter the stock again, but only on declines. Today (July 14), the shares of the company opened at Rs 147.20 on the Bombay Stock Exchange (BSE). Current EPS & P/E ratio stood at 33.74 & 4.58 respectively. The share price has seen a 52-week high of Rs 423 and a low of Rs 62 on BSE. ABG Shipyard along with its division Eleventh Land Developers (P) has made an open offer in order to buy equity stake in Great Offshore at Rs 375 per share. ABG Shipyard made this open offer to purchase 12.57 million shares, or 32.12% of Great Offshore`s diluted share capital. 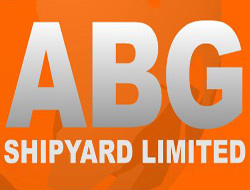 ABG Shipyard posted a steady increase in its standalone net profit for the three month period ended March 2009. During the period, the company’s profit increased 12.83% to Rs 519.60 million as against Rs 460.53 million during the corresponding quarter last year. Net sales during the period under review surged 34.04% to Rs 3,708.60 million, whereas total income climbed up by 34.28% to Rs 3,741.90 million. The company recorded earnings of Rs 10.20 a share during the quarter, posting 12.83% growth over prior year period.